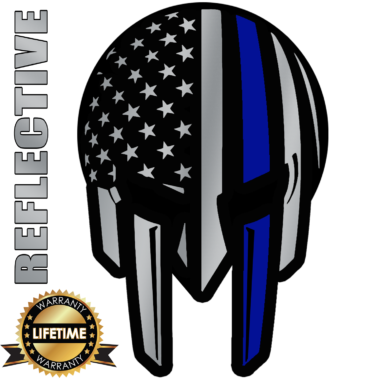 “Thin Blue Line” commemorates fallen law enforcement officers and to symbolize the relationship of law enforcement in the community as the protectors of civilians from criminal elements. Proponents of the symbol assert that the identifier is intended to show support for police. 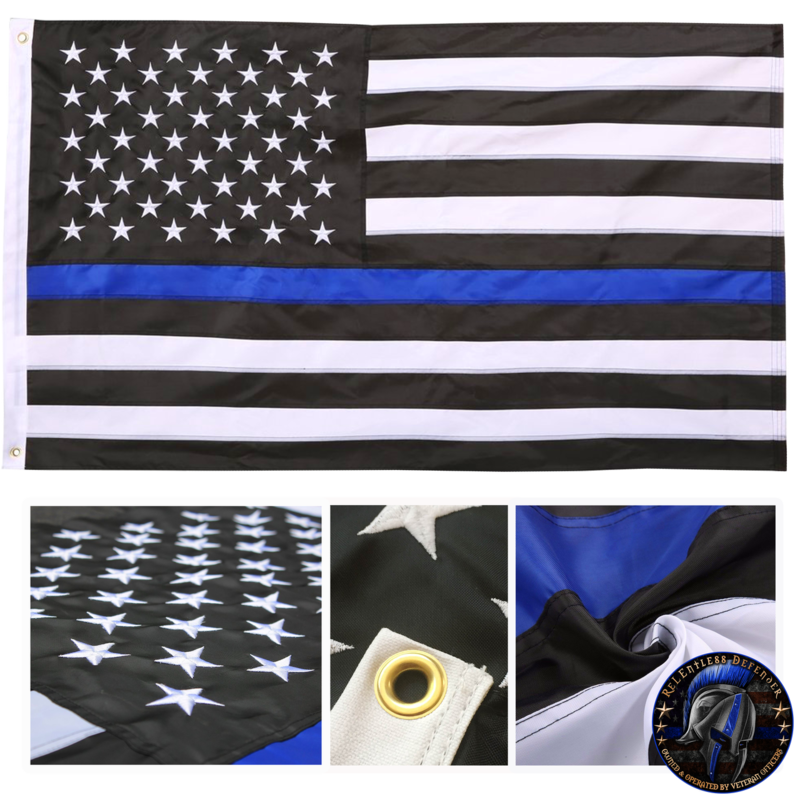 In the wake of controversies over police shootings, the Thin Blue Line Flag has become popular among law enforcement personnel, their families and supporters showing they reLEntlessly stand behind those who are willing to sacrifice so much. Great flag absolutely awesome flying it with pride in my front yard. Great flag, no issues at all with the product. Great looking flag. Very well made. I purchased the embroidered flag. The delivery time was quick. Looks great and flies proudly at my home. The perfect symbol for our law enforcement to know that we have their back! 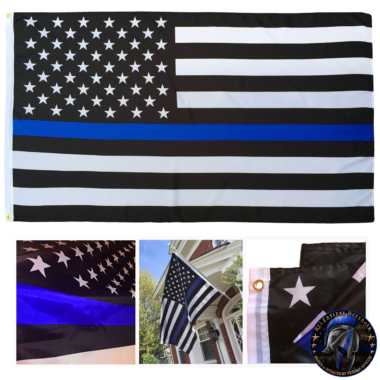 I ordered the embroidered Thin Blue Line flag and it arrived exactly on National Thank a Police Officer Day – it looks awesome hanging from our front porch. Great quality, very pleased with the product. THANK YOU! When I opened this one, I got goosebumps. I love what this stands for and the men/women who stand for all of us!!! Stitching and embroidery are spot on, colors look great and there is nothing flimsy or cheap about the flag. Great craftsmanship for a great symbol of our profession. bought as a gift for my s.o who is a LEO, loves it!!! So amazing to look at everyday. I was very impressed with the quality of this product. The embroidery was very impressive and will fly the Thin Blue Line Flag with pride. Gorgeous well made flag. Love that it is embroidered instead of printed. Thank you from a LEO’s family. I hung the flag the day that it arrived. My neighbor wanted to know what kind of flag is that. After a brief story about the flags blue line and my 2 sisters also being Cop’s, she said cool. Thanks for a quality product. I think reflective blue strip on your products my inhance the hats flags,and shirts. Extremely nice quality flag. I am considering framing this one inside my house and getting another to fly. I ordered the flag and it was shipped very quickly. I received it within a few days and upon opening it I observed the stitching was starting to unravel. I’m not you to complain but I really wanted to fly the flag and for it to last hence why I bought the higher quality one. I sent them an email with pictures concerning the flag and they responded quickly with a tracking number of a new flag that was being shipped. I didn’t ask for that and just wanted to let them know of the condition of the flag and maybe to check that batch of flags to make sure no other flags were in the same condition. I must say that their customer service is GREAT! I ordered this flag for my husband for Christmas. I am sure he will love it. My son took it out of package and we both love it. Delivery was really quick, and it looks great. Can’t wait to give it to my dad for Christmas! I know he will fly it proudly being a cop! 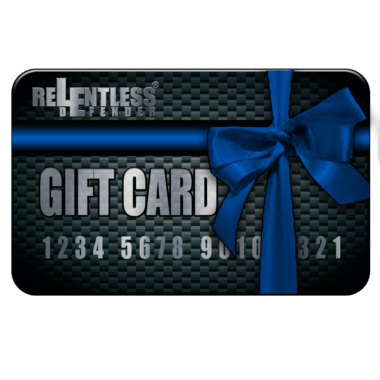 If you’re reading this it means that you are considering making a purchase from Relentless Defender. Let me put your mind at ease and assure you that you won’t be disappointed. Not only are the products high quality the customer service (when needed) is OUTSTANDING. I’ve ordered several products and have never been disappointed. I feel confident speaking for guys from my Dept. Who have also ordered several items and are also very satisfied, as we have discussed it many times. If you’re like me, you’re probably sceptical about such a positive review. Therefore, I’m going to put my work email here and invite you to contact me personally. I don’t work for RD, I don’t know anyone that works there and I have no affiliation with RD other than being a satisfied customer. Buy with confidence. Looks great on my back vehicle. 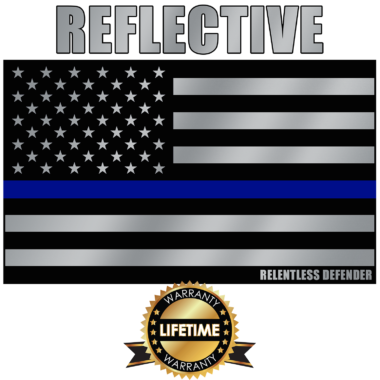 Simple and discreet that I belong and represent the blue line! 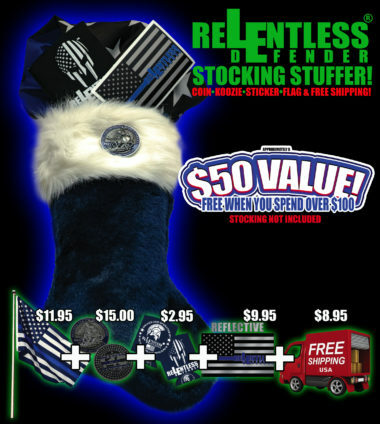 Relentless Defender continues to impress me on the quality of their products. This flash is very durable and really stands out. I will continue to be a Relentless Defender customer and supporter. Great product. Great workmanship. Is currently flying proudly. I am never disappointed with their products. I ordered this flag not knowing what to expect. When it arrived (three days later- wow fast) I was pleased to see it was made of high quality materials. The embroidery was clean and the flag itself looks outstanding. I also ordered a shirt and it too was high quality. I will definitely be ordering from here again. I ordered this flag solely on the reviews alone and I am so glad I did. Great quality. Absolutely beautiful. Can’t wait to proudly display it. Great Quality product from a Top-Shelf company. Would recommend to anyone. Great quality and durability. Proudly displayed and many people have expressed interest. Shipped fast. It’s a great buy and I recommend this and other products sold by this company. Great product, honored to be a part of the blue line family and to be able to show that pride with this flag. sewn in Stars and Stripes!!! The quality of this flag is fantastic. I see it lasting for a very long time. It will be flown outside my house. Have received alot of compliments after adding the flag to my office. Looks great and good quality. Great product! Not only the significance of the design, but great quality also. Very well made. It looks great flying from my porch! I bought one to hang at my house. 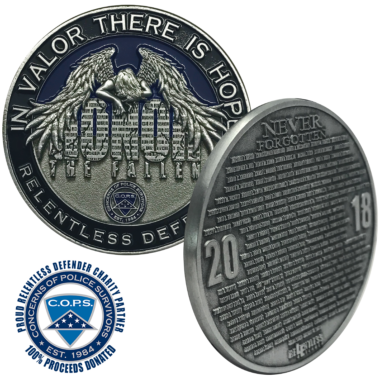 I later purchased one for a local bar where a fallen officer had once worked. Flagstaff, AZ is very proud of our LEOs and I am proud to support them. Thanks so much. Also I ordered a thin red line flag too. Super fast shipping. I was in law enforcement for 27 years. This flag is awesome.it means a lot to me I list many friends in the line of duty in my 27 years as a police officer. Would recommend this product to anyone. The craftsmanship of the flag is excellent. Looks great! Now, just need a good flag pole in the yard. Beautiful American Flag displaying the Thin Blue Line. Bought my flag for a Back The Blue event in Dallas this past weekend and the flag was able to withstand highway speed throughout the day. I will have to retire the flag due to the fraying & the grommets tearing, but I expected it to happen as most flags aren’t rated for that type of wind speed! This flag was perfect and did its job perfectly! It deserves nothing less than 5 Stars! I ordered the “AMERICAN “THIN BLUE LINE” POLICE FLAG (EMBROIDERED/SEWN)” from RD. They offered a great sale and it encouraged me to get the embroidered flag over the cheaper version. When the flag from RD came in I was very satisfied with my selection. The embroidery was crisp and the quality of the flag was excellent. If you intend to fly the flag outside I strongly recommend the embroidered flag. I was also glad to support a LEO owned business. Thank you for your great work! Great Flag!!!! As soon as I can get a flag pole, this great flag will fly high at my home. 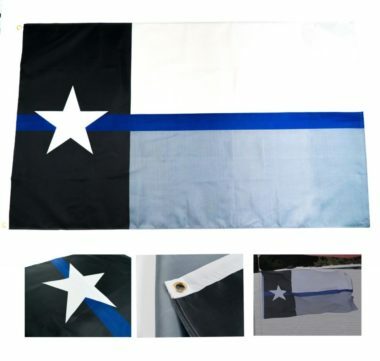 I had bought a Thin Blue Line flag from another website and was not very impressed with the quality of the flag. It was cheaply made. The flag I purchased from ReLentless Defender was extremely well made. I am impressed with the quality! More than satisfied with flag. Will make additional purchases in future. This flag is very well made and looks great next to my National flag. Its a great honor to have it out in front of my home, it keeps the memory of my brothers and sisters who gave their all when they wore the star/shield. Ordered this flag for my brother-n-law who is LEO. This was a birthday gift. I was very hesitant ordering off line, but this flag is amazing! it’s a huge flag, beautiful colors and quality workmanship!! I will be ordering another soon for my son for his home!! I’ve seen a lot of these flags but they were all painted and cheaply made. This one is heavy weight and the stars are embroidered. The rings that attach the flag to the pole are metal not plastic. This is a flag that will last for years and you will be proud to display it. Not my first or last purchase with them, great quality in the flags. Enjoy purchasing items from you all. Customer service is awesome. Very well made, fast delivery, quality product. I am ordering more for gifts. I was truly impressed with the quality of this flag! I ordered this flag after seeing it advertised on instagram. The sale prices was unbeatable, and coming from a good company, I knew the flags quality would be excellent. My flag arrived 3 days early, and I wasn’t disappointed with the quality. I can tell it will last me longer than the flags I used to buy on Amazon. High quality flag at a very fair price. Show your LEO pride i! Really fast shipping, get yours NOW ! Well put together. Prompt shipping. This flag surpassed my expectations! The quality of this flag is amazing, you will not be disappointed!! Awesome work. Attention to detail. Solid product!! Tnx again. This flag is awesome. It is made with quality material, and with care. Thank you guys for doing what you do. Your website was recommended by Kentucky goin blue. They had nothing but good things to say about you! The flag is awesome! It was on my flag pole 5 minutes after I received it. My Dad was an LEO. He taught me much respect and admiration for Law Enforcement. Do you have a catalogue? I’ve seen a few other items that I am interested in through Ky Blue posts. Keep up the good work with your quality items. Bought the flag for myself but decided to donate flag for a raffle to the Fraternal Orders of Police Lodge 911 bowling tournament. Flag was a big hit!!! The flag is awesome. The quality of the embroidery is perfect. Great price. Great quality product (Flag) and great customer service who went out of their way to correct an error that I made. Happy with my experience. I will be ordering more products again based on the quality of both product and service! And I’m definitely proud to fly my flag. I didn’t think the flag was going to be so big when I ordered it, for the small amount I paid. It has been through strong winds and negative temps, still going strong, no fraying yet. Love it! The quality on this flag is the greatest. This flag is without a doubt, the highest quality of flag you can find!! It is embroidered, and the stitching is impeccable! The material is thick, and appears to be designed to be flown outside, and to last!! We love ours so much that it hangs in our office in the winter, and flies on our boat in the summer! 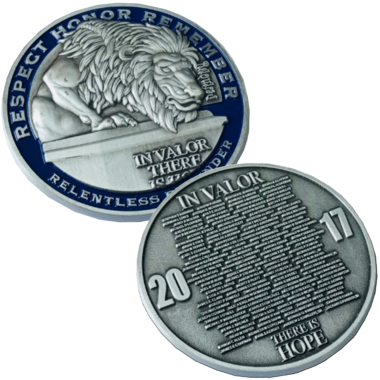 If having an incredible product, at a great price isn’t enough, Relentless Defender is by far the most charitable LEO brand in the business, giving back large portions of proceeds to charities and the families of fallen brothers and sisters in blue. Can’t say enough good things about this flag, or this company. Excellent quality. Embroidery is perfect. No loose threads, or cheaply made. Pictures don’t do it justice. Non embroidery flags go for a much higher price. Flag shipped out the same day as my order was placed and arrived quickly. It is made very well and is exactly what we were hoping for. Can’t wait to fly this flag on our center console boat! We used the other thin blue flag before that wasn’t sewn and it’s actually held up. But this one will last a long time! Super nice flag; the Arizona sun won’t fade or degrade this material. The quality material and embroidery was much better than I expected. I display the flag proudly. Absolutely love my flag. Very beautiful work & it was shipped to me very quickly.. Very pleased with my order.. Ordered the “Blue Line” flag for a department function. GREAT QUALITY flag, got a lot of compliment!! Very professional looking and goes well with Old glory! Spend the money, you will not be disappointed!! First time buyer, bought this to replace my other that went MIA. I am extremely pleased with the quality and that it will withstand the weather. Very pleased with everything I purchased and will be back for sure. The phrase “simply the best” isn’t strong enough of a phrase to rate the quality. This flag far exceeds the quality of the product and commitment to the brand. Shipping was super fast. Flash is very well made. Would highly recommend of you are looking for a flash that will last. This flag is made of great Material, and the workmanship is excellent as well, could not be More Satisfied !! I love this flag. Make very well with pride. Displays great and shows the support for LEO’s all over. This embroidered flag was bought to replace the one we have. It is bright, beautiful and has held up better than our other one. I would highly recommend this embroidered flag!!! I’ve bought multiple of these flags. They typically last me a year before they start to show any sign of legitimate wear and need replacing. I ordered 2 of these flags. 1 to replace one I had to use to bury a retired police k9. Got my flags in just in time before another retired k9 passed away. The handler loved the flag when we presented him with it. He has a quality item to remember one hell of a police K9! Great Flag! Bigger than I expected. Had to wait to order as they were out of stock, but once they were in it was shipped immediately. Proudly hanging in my Campus Office. Great flag! We are flying this outside of our house! Very well made. Great flag. Great quality. Proud to fly it. I bought this TBL flag to replace another I had because it was worn out. The quality of this flag is great. I love flying this flag for my fellow brothers and sisters in blue! Thanks RD!